January 26, 2018 -- The combination of digital breast tomosynthesis (DBT) with synthesized 2D mammography images increased the cancer detection rate in an Italian breast screening program -- with recall rates and radiation dose similar to full-field digital mammography (FFDM). The prospective study from Verona, Italy, included more than 16,000 asymptomatic women. The research team led by Dr. Francesca Caumo, formerly from the UOSD Breast Unit in Verona, compared DBT plus synthesized 2D images with women who were screened with FFDM. They found the cancer detection rate with DBT and synthesized 2D was 9.30 cancers per 1,000 screening exams versus 5.41 per 1,000 screening exams with FFDM. An example of architectural distortion detectable only on DBT. 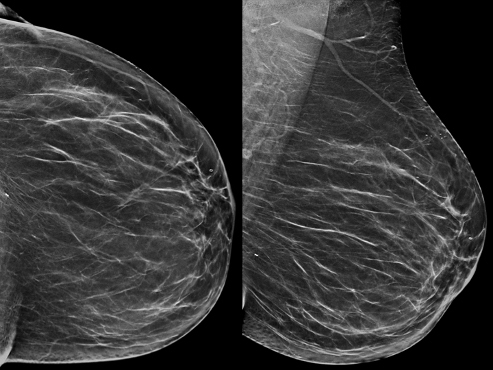 Above: A 54-year-old woman with no abnormality on synthesized 2D mammography. Below: Architectural distortion depicted on the left tomosynthesis (upper-outer quadrant) image. The microhistological examination after DBT-guided, vacuum-assisted biopsy revealed an invasive ductal carcinoma (grade 2), confirmed by surgical excision. All images courtesy of Dr. Francesca Caumo. "The transition to DBT plus synthetic 2D imaging in the Verona screening program was associated with increased breast cancer detection rates compared with screening with FFDM, with comparable recall rates for these screening strategies," the study authors wrote (Radiology, 13 December 2017). 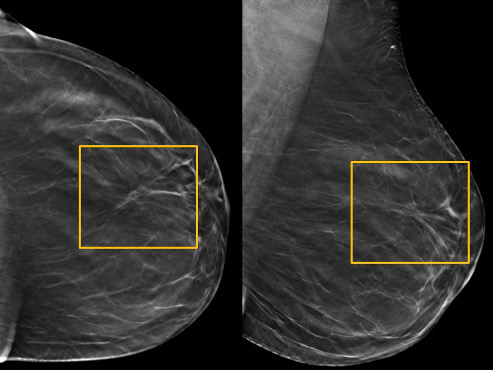 As more facilities adopt DBT, many people involved in mammography have expressed the desire for a 2D image to accompany the 3D dataset. Synthesized DBT allows 2D images to be created from the 3D dataset without having to perform a second acquisition, thus reducing radiation dose. While radiation levels for synthesized 2D images have been measured at acceptable values (1.95 mGy ± 0.58) for screening, very few studies have examined the performance of DBT plus synthesized 2D in real-world screening practice. So Caumo and colleagues did precisely that. They included 16,666 asymptomatic women ages 50 to 69 recruited in April 2015 through March 2016 for DBT plus synthetic 2D (Selenia Dimensions, Hologic) screening in the Verona program. A comparison cohort of women screened with FFDM (n = 14,423) in the previous year was included. The average glandular dose for a single DBT view was 2.09 mGy ± 0.55. The average glandular dose for a single-view FFDM was 1.48 mGy ± 0.58. The researchers found 155 cancers (136 invasive and 19 ductal carcinoma in situ [DCIS]) in the DBT plus synthesized 2D imaging group, versus 78 cancers (58 invasive and 20 DCIS) in those screened with FFDM alone. This corresponded to cancer detection rates of 9.30 per 1,000 screening exams with DBT plus synthetic 2D imaging versus 5.41 per 1,000 screening exams with FFDM alone. The higher cancer detection rate for DBT plus synthetic 2D remained true for low- and high-density breasts. Other results are listed in the table below. DBT plus synthesized 2D screening had a higher cancer detection rate for the first screening round, subsequent screening rounds, and overall. The tumor detection rate for large tumors (pT2+) was similar for the DBT plus synthetic 2D imaging and FFDM groups (1.18 per 1,000 versus 1.14 per 1,000, respectively). The researchers also found screening with DBT plus synthetic 2D was associated with an increased cancer detection rate in patients in all age groups except those ages 50 to 54 (6.4 for FFDM versus 6.8 for DBT plus synthetic 2D). In addition, the proportion of DCIS lesions was lower for DBT plus synthetic 2D screening than for FFDM screening, but the group found no statistical difference between the DCIS numbers. "Results regarding the cancer detection rate confirmed our expectations," Caumo told AuntMinnieEurope.com. "We were initially more optimistic about the potential decrease of recall rate by DBT (as proved by a number of American studies), but from this study, we realized the potential decrease of recall rate allowed by the reduction of tissue superimposition permitted by DBT is balanced by recalls 'generated' by DBT." That recall rate -- 4 for DBT versus 4.2 for FFDM -- combined with the improved cancer detection rate and comparable radiation dose level, makes for a compelling argument to switch to DBT plus synthetic 2D mammography. "In most studies, DBT has been used in combination with 2D mammography, with double acquisitions and an increased radiation dose to the breast," Caumo and colleagues wrote. "Use of synthesized 2D images allows an acceptable radiation dose, in line with the European Guidelines for Quality Assurance in Breast Screening. In the Verona screening program, we transitioned to DBT plus synthetic 2D imaging, increasing cancer detection rate and maintaining similar rates of recall for assessment." European guidelines recommend double reading of screening mammograms, but Caumo and colleagues found a significant decrease in discordant referral recommendations for verified cancers for DBT plus synthetic 2D imaging compared with FFDM. One reader detected only 11 breast cancers (7.1%) in the DBT group, versus 28.2% in the FFDM group. The results suggest double reading DBT plus synthesized 2D may not be all that useful, which is in line with previous research. The use of computer-aided detection (CAD) also could aid in identifying cancer and further reduce the need for double reading, although its effect on recalls requires further investigation, the study authors noted. Something else to investigate is PACS image archive implementation -- one DBT view takes up the same amount of storage space as a CT scan (about 80 MB), something to consider when planning or extending the infrastructure to enable high-volume DBT screening. And the time needed to read each DBT image is longer than for FFDM -- 38.5 images per hour versus 60 images per hour. "Thus, before implementation of a screening strategy based on DBT, careful resource and infrastructure planning is required and should be complemented by rigorous health economic evaluation to inform screening policy decisions," the authors wrote. The prospective trial remains ongoing, and the researchers plan to gather data on interval cancers and T2+ cancers that will complete the "picture" about DBT screening performance. Caumo and her colleagues are also working on the management of B3 lesions and investigating the possible usefulness of DBT for personalized screening in young women with a certain level of breast cancer risk.